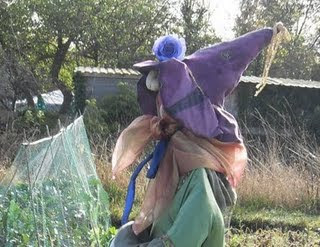 Welcome to Techno-Billies: A Hat Too Far!! 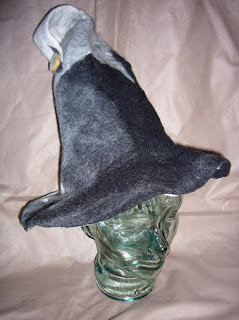 She makes felted pointy hats (and other types of historical hat too). I have wanted one of these for such a long time, but alas, it is beyond my pocket - and would probably look totally ridiculous on me (but what the heck!). Unfortunately her website is not working as well as it should but there are other hats of hers here. We shouldn't have to wait until this time of year and a party to wear a hat like this. I would happily wear one of these on the coldest days of winter - Except that this pointy hat is nowadays synonymous with Halloween. And witch's. During medieval times the pointy hat was pretty normal wear for pretty normal people. What does Halloween (or Holloween as the Americans pronounce it) mean to us nowadays? When I was a child in Scotland all trick or treaters had to perform for their rewards - songs were sung or jokes told or dances performed in draughty hallways by nervous children hoping for rewards of sweets or cake or pennies. And we were genuinely afraid to go out... it was really dark outside and you never knew who you would meet. We would not have gone on our own, no way!! Nowadays, so many children turn up at the door with hands held out - believing their hastily constructed disguise excuse enough for their expected prize. I hate that. It's more akin to begging. 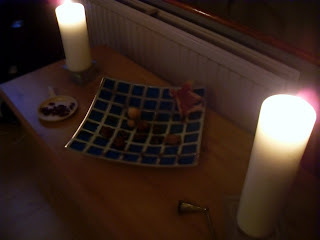 And they have no conception of why they are dressing up and disturbing the peace at neighbours doorways. It's a carnival atmosphere... that is not All Hallow's Eve. Well not for me anyway. This year I shall do what I always do. Ignore the doorbell. Pretend that we are not home. Bah humbug!! Yes indeed. 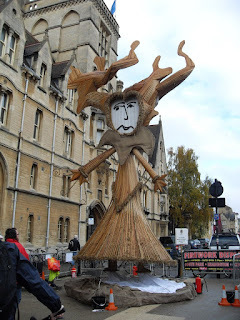 I was glad to see that in Oxford they had a Wicker Man - displayed on Broad street earlier this week. Actually he is a she. an Ice Princess which won a competition for the best design - the designer was 7 years old!! I love it!! They are burning the Ice Princess on 7th November along with a large firework display. We may be able to go but I am not sure yet if we can, but even if we do, I think I will have to leave the pointy hat for Gladys. I "know" Sally from ravelry, and love her creations! Have you visited her blog?